Junior forward Marissa Everett converted a free kick from just outside the penalty area in the 27th minute, then pounded home an insurance goal from about the same spot on the opposite end of the pitch in the 49th minute to lead the Oregon Ducks to a 2-nil win over the Kansas State Wildcats Sunday afternoon at Pape` Field. 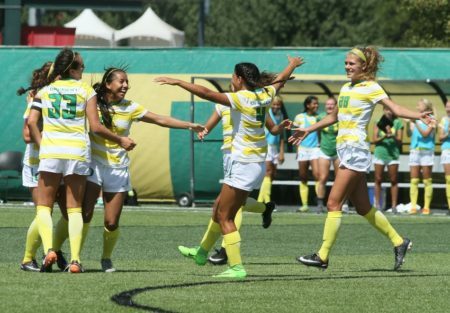 The victory evened the Ducks’ season mark at 1-1 and was a welcome result after struggling against North Carolina State in Friday’s 4-1 opening loss. Everett’s first goal was perfectly struck, clearing the Wildcat line of defense and beating the keeper to the top right corner. “I’ve been practicing that shot all summer, it was nice to finally be able to show it in a game,” she said. “That’s the Marissa we know at practice,” Mertz said. Everett became just the 31st Duck in program history to score multiple goals in single game. The Oregon defense also deserves credit, holding the Wildcats to a pair of corner kicks and five total shots, three of which were on frame. Halla Henriksdottir went the full 90 for the Ducks in net to pick up the clean sheet. The Ducks dominated the home side of the stat sheet as well, recording 23 shots – nine on goal – and forcing the Wildcats into yielding 11 corners. For Oregon it was a win they hope will pay dividends on the road with the Ducks set to face Texas A&M in College Station, then Oklahoma and Cal Poly in Boise before they return to Pape` Field to host Idaho at 7:00 pm on Friday, September 8th.